This past birthday Russ had asked where I wanted to go for dinner. As we had previously gone to Rodney’s Oyster House in Yaletown before, I decided to go there and have some fish for dinner. When I arrived from work that day, the dinner almost didn’t happen. Russ had told me that when he called to reserve a table, he was greeted by a very rude person who told him that we had to be out by 8:30pm. I was tempted to cancel the whole thing as I thought that was very rude coming from a staffer, but we went anyways. We arrived at the restaurant just before our 6:30pm reservation only to find out that our table wasn’t reserved for that day, but for the next day. We were both a little shocked, but then one of the hostesses quickly erased our name from our next day’s reservation and quickly sat us down to a table. There was no hesitation on her part and we were both impressed by that. From the moment you walk into the restaurant you feel as if you have been transported to a restaurant on the eastern shore. 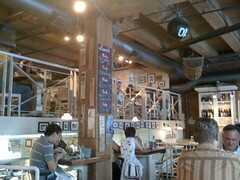 The restaurant resembles a fish shack with many sea and ship items as decoration. 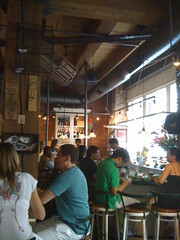 Tables ranged from the standard tables, to bar style tables and eating area around the bar itself. The menu is fairly simple (sorry the link is for their Toronto location) with mainly fish dishes for both appetizers and main courses, as well as their name sake – oysters. As this was a celebration of sorts, Russ and I ordered oysters as appetizers. The oysters were awesome and you have choice of sauces to try with them which made them even more tasty. I also ordered a Manhattan Clam Chowder, which I was a little disappointed with as it was a tomato base and I felt I was eating a minestrone soup instead. For our main course Russ ordered the Shrimp in Coconut & Curry and I ordered the Pasta with Scallops. Both were utterly outstanding. I couldn’t get over the size of the scallops in the pasta and the flavour the shrimp with coconut and curry was. Overall the experience was very pleasant, the staff was very educated, and we were treated fantastic – minus the reservation screw-up. I highly recommend you check them out as I’m sure you will be greatly surprised! Gus. If you like Oysters (Raw) they have low tide specials on between 3 and 6 pm weekdays and an extended special menu on Sundays. This is typically when I go although Wanna and I went for lobster one evening and they did a great job. I think the Toronto and Vancouver locales are not longer associated by the way. 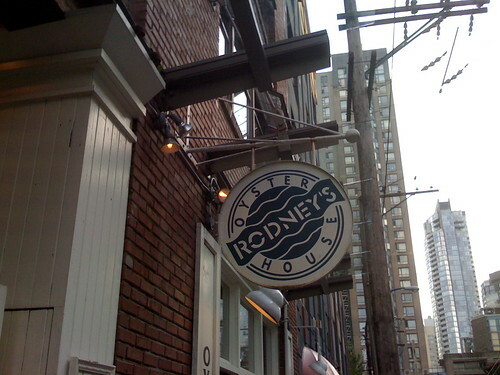 With that said Rodney’s in Toronto is a great place, but I had reservation issues with them too. I went to Rodney’s for a birthday dinner last summer and was underwhelmed, to say the least. The atmosphere was noisy and overbearing (are all the waiters wannabe stand up comedians with sales quotas?) and the food, while relatively tasty, was skimpy and overpriced. I would go back for one of their signature Caesars, though. They were definitely worth the price of admission.